Who can officiate at life cycle events? The Jewish Secular Community of Cleveland (JSC) has three madrikhim who are licensed to officiate at life cycle ceremonies, and another member who is a Humanist counselor, and licensed to perform weddings and other life cycle ceremonies. Although we currently do not have a Bat/Bar Mitzvah program, you may contact Sandra Arndt, Education Coordinator for Secular B’nai Mitzvahs, for information at arndt.s@sbcglobal.net. Four members of the JSC were married by two other members. 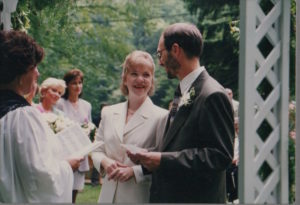 Our officiants also perform other joyful events, such as baby namings and vow renewals. Ask us about it! When a death occurs, a surviving family member or friend should contact the President or Chairperson of the Good and Welfare Committee. The one who is contacted will notify the other. The JSC can provide the following types of assistance. An important measure of the integrity of any congregation, whether “religious” or secular, is the degree to which members of that congregation can rely on it in times of need. When the death of a loved one occurs, the JSC reaffirms its commitment to reach out to members in this most trying of times. They offer a full range of funeral services and can assist in preplanning. A nonprofit dedicated to simplicity, economy, dignity and forethought in funeral arrangements. The purposes of the Society: to promote, through education and other means, dignity and simplicity in funeral arrangements; to plan for its members and their families either simple cremation or simple burial; to aid in the bequest of body or anatomical gifts (cornea, kidney, temporal bones) to medical science. Hillcrest is non-sectarian. This may be important to those whose immediate families include non-Jews. There are also plots available only for use by Jews and plots available for Jews and non-Jews. Thus plots for spouses/partners in interfaith families can be side by side. Their chapel can seat about 50 persons.